Updated video on meet my alters / personalities. Meet Autumn, Iris, the Host, and the Controller. A lot of progress has been made, but there is still more to overcome. In order to overcome the problem, you have to face it. I am learning to express myself better and am coming to terms with myself and what I've been through. Doing this video helped more than I thought it would! Updated video on meet my alters / personalities. Meet Autumn, Iris, the Host, and the Controller. A lot of progress has been made, but there is still more to overcome. In order to overcome the problem, you have to face it. I am learning to express myself better and am coming to terms with myself and what I’ve been through. Doing this video helped more than I thought it would! Dissociative identity disorder / multiple personality disorder may come to mind. But, we all have different aspects of ourselves in various degrees, usually referred to as ‘subpersonalities.’ I’ve learned about these sides and am making progress at accepting them (myself in its entirety), and express them so I do not repress aspects of myself. That is what has helped me on the road to recovery. Autumn has more difficulty switching to the others (less suggestible), while the host has the easiest time (more suggestible). Iris can switch to another by allowing / coercing the others to come out on their own. Usually when I switch, or rather be taken oven, it is usually accompanied by twitching of my neck and confusion / disorientation. Though, I think this is anxiety related. Also, switching like this for me is usually stressful, tiresome, and causes me headaches and confusion lasting for some time afterwards. Hi everyone! I thought I’d make introduce you to my various personalities so you can learn who they really are. So, this is going to be an update video to one I did a year ago from when this video I’m recording now is posted. If you would like to see that video there will be an annotation and a link in the description. [Meet My Alters (part 1)] I was very hesitant to go back to that video because it was awkward for me to view and because I felt disappointed and ashamed of myself because of it. But, when I got to the root as to why I felt that way, it wasn’t because I felt bad with myself, it was that other’s opinions were influencing what I thought about myself causing me that doubt. I was letting it get to me instead of doing my own thing. Calling me fake, a disgrace to those that truly suffer with mental disorders. I wanted to delete it. I took those opinions personally and that is where the one calling me a faker originated. I managed to get that under control since then by realizing that it was my own self-doubt that was causing the issues. The fear I had when talking about the various sides of myself and the feeling I had about being a fraud is now lifted because it originated from what other’s would say to me and me coping the way I did. I instead use these videos as therapy for myself. I thought it was for attention seeking, sympathy, faking and what not. But, I’ve learned that it was other’s perception that gave me the idea when in fact it was therapeutic for me to express myself the way I did. I’m done feeling ashamed and doubting myself, repressing who I am because of what other people tell me I am. Because I know what I’m doing is helping myself recover. So, I am doing this video because of how much I have grown and learned about myself since just last year. I want to document my progress and understand myself deeper. I see it as a form of ego-state therapy which has helped me recover and not feel ashamed of myself for who I am. [Ego-State Therapy] I feel I can express myself and my emotions so much better since that previous video. I’ve gotten past the point of labeling myself so it’s not a big deal to me if this is a disorder or not. It’s helpful to me to learn this way and express myself in this nature. This is something we can all relate to in a sense since we all have different sides to ourselves. They are often referred to as subpersonalities. I did a video all about this and how we all have multiple personalities so there will be an annotation and a link in the description. 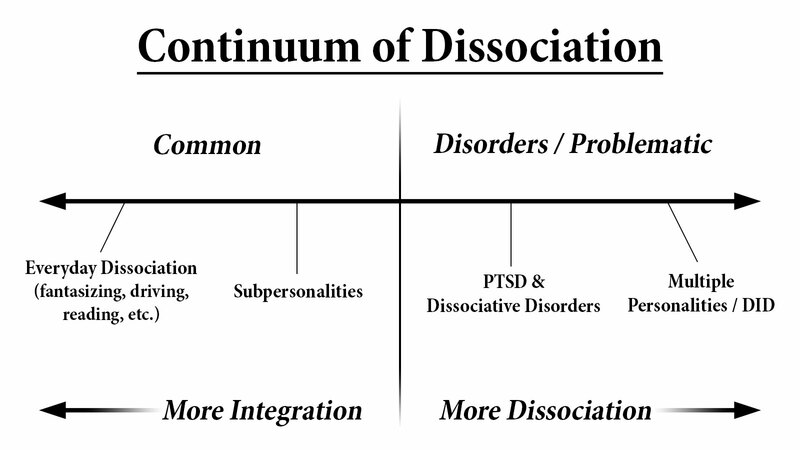 [Subpersonalities] Many people just think of dissociative identity disorder, also known as multiple personality disorder, but while this is on the more severe end of the dissociative spectrum, we all have experienced multiple selves. By becoming those selves, learning about them, why they are here, it can help someone recover when they are compartmentalized. Again, I talked much more about this in my subpersonalities video. Subpersonalities are not DID because as I said DID is more on the severe end of the dissociative spectrum and is not a common occurrence. But subpersonalities are common amongst all of us and you can utilize them to learn about yourself on a deep level and express yourself. And especially if you’ve been through trauma or repress your emotions and aspects of yourself, these sides can be more prevalent and it’s important to learn about them as they hold the key to you being able to express yourself properly, without denial or suppression. And the last few things I wanted to bring up before getting to this is that this will not be all the personalities because I’ve managed to express my child side and sexual side better now that I don’t feel as ashamed of those aspects. And since talking about the sexual abuse and what I’ve been through, it allowed me to learn to express my sexuality in a better way and not feel so guilty and ashamed of myself for what happened and what I caused myself. The previous ‘Meet My Alters’ video was very unorganized, talking about irrelevant, materialistic things, and what not. As well as being incredibly nervous. So unlike that one, this video will be scripted, unless otherwise noted, so you can actually learn about who they are. Another thing is, makeup and clothing is absolutely irrelevant. This was something many people had questions about in the previous video. It doesn’t matter. No one would change clothes all of a sudden like that. So, this video is going to be all in one go, as long as my camera lasts that long since it tends to overheat after about 20 minutes so there may be a cut if that was the case. Switching will be done as well. It’s not too difficult to do when you can, not only learn what the triggers are, but learn about the personalities themselves and let them come out and express themselves. It’s not about forcing it, it’s about allowing it. But, it can be like talking in your mind to who you want to come out and allow them to come out. Again, there is more info in my subpersonalities video. Yes, it can be like role-playing, someone getting into character and being them. But more importantly it’s about allowing them to emerge and expressing themselves. But this doesn’t always mean I have control all the time because I do not. There have been plenty of times I have no control whatsoever and have lost track of my time and said and did things I do not recall saying or doing, nor even would say or do for that matter. But, expressing myself this way is what has helped aide in my recovery and I can see my progress now. And while it is intimidating to get to the core of what is going on and causing the problems I had, I am making progress and going down the road of recovery. So, I am Autumn. I run this YouTube channel and the one that did the intro to this video. I haven’t always been around. I came into existence when the original, or host, couldn’t handle her life after transitioning. She couldn’t deal with herself or her life so she retreated, and that’s where I came to exist. I never existed prior to her transitioning because she was always reclusive and apathetic when she was a he. I have been there to protect her and so she could express herself, but not directly because of how low she felt of herself. How you can view me is like a mask of the host personality. She’s feeling depressed and upset, I mask that and am happy, despite the fact that I am struggling deep down, which is the host, or real me. Another thing is, I call her the host and not refer to her by name because she doesn’t want her name out there. Host is used to refer to her because she is the original one and is the core of my being. I refer to her as the ‘real me.’ I hide what she is feeling so she doesn’t have to deal with it. That’s why I am the mask of her. I hide her and protect her from the negativity that she sees in the world. I put on a smile when I am not really happy to hide myself. That self being the host, or real me, and the smile that hides it is me, Autumn. And lastly, and this is something that is uncomfortable for me to admit, but sometimes the host just gets out of control at times, filled with paranoia and freaking out. And, I have to tie her to a bed to make her stop. Now, this all occurs in my mind. I restrain her to a bed and tie her up in my mind to stop her from getting out of control. And, that’s the only way I’ve learned to deal with her when she gets that way. Hi, this is Iris. I have always been around even when the host was still a male, even as a child. I am seen as her higher self and have always steered her on the right path. During her, well his at the time, teenage years, I would save her from committing suicide and self-harming. She would feel so negative and wanted to end it all but I was there to guide her on the right path and to think positively and of future goals. And, when she put those goals in mind and focused on how she wanted it to be, she became who she wanted to be and was able to live the life she always wanted. I have always been dedicated and focused on her future goals and have guided her on the right path in life and am the one that has the tactics for success. Unlike what the host and Autumn think, the host is not the real her. It’s actually me, her higher self, that is her true self. The host lives in the past and cannot plan things according to how she wants them to be. She is a manifestation of the past coming back and reliving itself and this is evident when you look at just how she thinks and anticipates things. But, I’ve always been there to help mend those past wounds and to help get her in a better place where the past will not relieve itself. Hi. This is me, who I really am. It’s difficult doing this and talking about it because I hide it. Autumn is how I hide it because I don’t feel as though I can express myself. I feel ashamed of myself because I’m not worthy of having the things I want. But, I am slowly making progress. I was so nervous when I came on here, what two or three times before. But, I’ve come a long way. Though, I can’t do it by myself. I couldn’t go on here by myself. So, I hid myself and there Autumn was. Which yeah that is how I hide myself. I know that now and have recognized it. But, I just feel like everything is going to be taken away from me because I don’t deserve it. I see my success and just see a way that would damage me even more. I truly…I truly do just want to be accepted and loved, but I just want to be alone. I will never have it because I guess I don’t love myself or think I deserve to be happy. I feel like I am controlled into a false belief system. Hi. Would you like to really know who this person really is? I think it’s time for you to know who this person really is. I am the one that controls everything this person does. Every single thing that they do. They don’t exist. It’s only me that exists. And, I control all of it. They were never aware of me because I control everything and they do not…that is why they know about each other. That is why they know the things that they do about one another. That is why there is the level of control that there is. Because I’m the one that does it all. I’m there behind the scenes doing all of it. And, they don’t know about it. But once they did start to figure it out, that is when, that the plan that I have set will be fulfilled. Here’s the plan: This person does not deserve any happiness. This person does not deserve anything good in their life. Nothing. They don’t deserve it. They are not worthy of it. So, that’s my goal to take it all away from them. They don’t deserve it at all. None of it. So, here’s what I do. I lead them on the path to recovery, like what they’re doing now, to make it seem like they are good, that things are going well for them. And then what you do, is you take it all away. All of it, you take it all away. So, she would be left with absolutely nothing. Now, I’m sure you’re asking, if they don’t exist, and I control them all, wouldn’t that just be hurting myself? Well no, I wouldn’t be hurting myself, I would be hurting them. Because I am not them. They don’t actually exist, but I control them all. Whereas I am a separate entity entirely. And, they do not know about me. They do not know about what I do. But, the reason why I am making my presence known more recently, because I’ve been to the therapist and told her the same thing. I told her that the reason for therapy was to make everything worse. And, she knows that. Of course, she didn’t believe it. She was hesitant to comprehend what was coming out of my mouth. But, that’s the truth. Because, I manipulate the situation to make it seem like things are getting better, and then I take it all away. But, the reason why this person needs to know of my presence now is because it’s finally time to take that all away from her. She has all this success, all these good things happening. And, she’s so focused on where she wants to be. And then we take that back and we go all the way back. We go all the way back to when things were so much worse. We make it so much worse. So, that’s why I am recording this right now. Because she will watch it back and she will understand that I mean business. And that she will not get away with anything she’s done. Now, how I’m going to end this is something that I did with the one that would call her fake all the time. I would use that one to cause her even more pain, cause her even more damage. And, what I would do…you know, I would have it physically hurt her, emotionally, all sorts of things. What I would have it do though is in the middle of all that I would have it count to three and snap its fingers and it would go away. Instantly, just like that, it would go away. And, she would be left there not knowing what just happened. Because the whole time she was there in the background watching herself hurt herself, abuse herself, but it wasn’t her doing it. And then it would just leave, just like that. And when it would leave, she would be devastated. She would feel so upset that it would leave. And, that’s how I’m going to end it right now. And really you just have to talk to her directly to do that. And she’s saying right now, “No don’t…don’t do this. Don’t do that. Please don’t do this. Please don’t show the world who you really are.” But, that’s exactly what this is. So, we’re going to do it right now. You ready? I’m going to count to three and I’m going to go away. As soon as I snap my fingers I’m going to go away and you’re not going to know what’s going on. Now before I was so rudely interrupted by this camera, I was saying that I would use that fake one to count to three and snap its fingers and it would go away. And, when it would go away she would be left there not knowing what just happened, just so upset and disappointed, and even would cry at one point. So now, that’s how I’m going to leave this video. That’s how this is going to be all ended now. So, I’m going to count to three and I’m going to snap my fingers and I’m going to go away and she’s going to be left here, and we’ll see what she does. Ok? And, all you gotta do is just talk to her and tell her that. > I’m going to count to three and snap my fingers. And when I do so, I will be gone and you will come back. >> Oh no, please don’t do this to me. > Yes. And, that’s exactly what we’re going to do right now. It’s very very easy. All you gotta do is one…two…three (snaps fingers). >> Oh, did you not fully go away? Is that what it is? Sorry about that. Sorry. Sorry you had to see that. Why did you do that to me? I’m sorry. I’m just doing this to get back. I didn’t want to show that. I don’t know. I’m doing it so I can overcome it. I guess that’s why. Well, I’ll certainly make a note as to what just happened there because I don’t know. So, after I watch it back I’ll record something else later. So, thank you. Thank you for witnessing that. So, bye bye. Looking back at that section, I’ve never been able to fight that off. It’s always just taken complete control over me and I didn’t know what it would do. But, I can see how I took it over towards the end. I didn’t let it leave the way it wanted to, by doing that abandonment tactic, but I came back to myself and overtook it. I think that is perhaps me getting control over my abandonment issues. I feel like I learned a lot and maybe this will mark change in my life and finally overcome that negative aspect of myself, that personal demon. I’m at a lost right now, but I really needed to see it. Like the one calling me fake in the previous video, I will fight it off because even if it did control me, I will not let it have a hold of me any longer. I will be free to be me and express myself and it will have no say in that. I feel like it is a major obstacle, but I know I will overcome it. So, thank you so much for watching! I was so hesitant at making a part two of the “Meet My Alters” video because of how popular it was and all the hate it got. However, the moment I realized that the negative views I had about it were because of people who would say negative things online, I immediately dropped any fear of posting a followup video. As for the content of the video, it was scripted and planned out, besides the controller segment and the part with the host taking back control. They each wrote their specific part and when one was finished reading their part, they let the other one come out to continue on. I knew all along that the controller was going to come out during the host segment. How did I know this? Because it kept threatening me that it was going to make its presence knowing during the video. It would plan it. However, I wasn’t scared of it as I think it was important that I see it surface so I could understand it. Sure enough, watching it back and what it wanted was life-changing. Since then, I’ve been working on overcoming it.